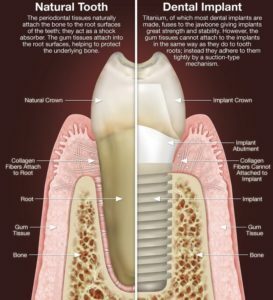 How Does a Dental Implant replace One Tooth. The thought of losing a tooth can be pretty scary, let alone need to have a tooth removed and replaced with a dental implant. Dr Adams is a dentist who sedates for dental implants. We are a sedation dental implant center located in Burtonsville Silver Spring near Columbia Maryland. If you are looking for a local dentist who offers full sedation for dental implants, you have found us. A dental implant can be done in one easy sedation visit. Start Full IV Sedation with Dental Sedatives such as Midazolam and Fentanyl. Bridge replaces a tooth by using the teeth adjacent to the missing tooth space. A bridge is essentially three connected crowns and requires drilling down the adjacent teeth. Cleaning is done by fishing floss under the connected teeth since flossing is not possible since the teeth are connected. 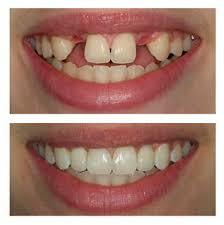 Implanting teeth cures many problems caused by tooth loss. Implants are without question the best way to replace teeth permanently. Tooth Implant is effectively the replacement of a tooth root. Replacement of root structure permanently replaces lost jaw bone support and chewing function caused by tooth loss. Implants look, feel and are cleaned like natural teeth. Past treatments such as Bridges and Dentures connect teeth or put pressure on remaining teeth and do not replace jaw bone support and chewing function. Dentures and Bridges ultimately lead to more tooth loss.